HPC-as-a-Service is a well known term in the area of high performance computing. It enables users to access an HPC infrastructure without a need to buy and manage their own physical servers or data center infrastructure. Through this service small and medium enterprises (SMEs) can take advantage of the technology without an upfront investment in the hardware. This approach further lowers the entry barrier for users and SMEs who are interested in utilizing massive parallel computers but often do not have the necessary level of expertise in this area. To provide this simple and intuitive access to the supercomputing infrastructure an in-house application framework called HEAppE has been developed. This framework is utilizing a mid-layer principle, in software terminology also known as middleware. Middleware manages and provides information about submitted and running jobs and their data between the client application and the HPC infrastructure. HEAppE is able to submit required computation or simulation on HPC infrastructure, monitor the progress and notify the user should the need arise. It provides necessary functions for job management, monitoring and reporting, user authentication and authorization, file transfer, encryption, and various notification mechanisms. HEAppE Middleware is licensed under the GNU General Public License v3.0. For commercial use, contact us via support.heappe@it4i.cz regarding the proprietary license information. 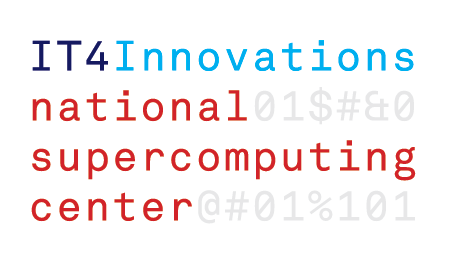 The IT4Innovations national supercomputing center operates supercomputers Salomon and Anselm. The supercomputers are available to academic community within the Czech Republic and Europe and industrial community worldwide. Both supercomputers are available to users via HEAppE Middleware. The Salomon cluster consists of 1008 compute nodes, totaling 24192 compute cores with 129 TB RAM and giving over 2 Pflop/s theoretical peak performance. Each node is a powerful x86-64 computer, equipped with 24 cores, at least 128 GB RAM. Nodes are interconnected by 7D Enhanced hypercube InfiniBand network and equipped with Intel Xeon E5-2680v3 processors. The Salomon cluster consists of 576 nodes without accelerators and 432 nodes equipped with Intel Xeon Phi MIC accelerators. The Anselm cluster consists of 209 compute nodes, totaling 3344 compute cores with 15 TB RAM and giving over 94 TFLOP/s theoretical peak performance. Each node is a powerful x86-64 computer, equipped with 16 cores, at least 64 GB RAM, and 500 GB hard disk drive. Nodes are interconnected by fully non-blocking fat-tree InfiniBand network and equipped with Intel Sandy Bridge processors. A few nodes are also equipped with NVIDIA Kepler GPU or Intel Xeon Phi MIC accelerators. This work was supported by The Ministry of Education, Youth and Sports from the National Programme of Sustainability (NPS II) project ”IT4Innovations excellence in science - LQ1602” and by the IT4Innovations infrastructure which is supported from the Large Infrastructures for Research, Experimental Development and Innovations project ”IT4Innovations National Supercomputing Center – LM2015070”. HEAppE's universally designed software architecture enables unified access to~different HPC systems through a simple object-oriented client-server interface using standard web services. Thus providing HPC capabilities to the users but without the necessity to manage the running jobs form the command-line interface of the HPC scheduler directly on the cluster. For security purposes HEAppE enables the users to run only pre-prepared set of so-called Command Templates. Each template defines arbitrary script or executable file that will be executed on the cluster, any dependencies or third-party software it might require and the type queue that should be used for the processing (type of computing nodes to be used on the cluster). The template also contains the set of input parameters that will be passed to the executable script during run-time. Thus, the users are only able to execute pre-prepared command templates with the pre-defined set of input parameters. The actual value of each parameter (input from the user) can be changed by the user for each job submission.